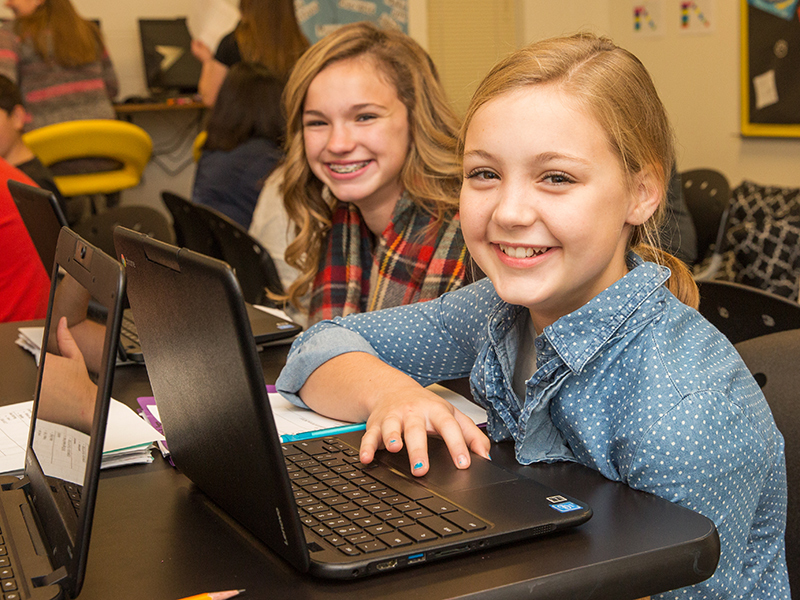 Teachers at Cisco Junior High School believe teaching to the whole group can be an effective method of instruction in the personalized environment. Students frequently work at their own pace, in small groups or with partners, and have choice in their work. There are times, however, where the large majority of a class is struggling with a concept or needs direct instruction. For example, 7th grade math students must all know the Texas State Readiness Standards. Data early in the year showed similar gaps in knowledge across the entire class, so this year, these standards are taught and reviewed weekly as a whole group. Whole-Group instruction at Cisco extends beyond traditional paced lectures and is used to address student needs and extend learning. Throughout the week, teachers may notice most of their students struggling on a similar concept and deliver a whole-group mini-lesson later in the week to address it. Teachers also use inquiry and discussion-based techniques to challenge students with open-ended conceptual questions, as well as guide constructive dialogue and discourse as the whole class works to solve a problem. Participates in whole-group instruction, asking questions and taking notes. Participates in inquiry and discussion-based instruction, frequently interacting with other students and his or her teacher. Determines when a class would benefit from whole-group instruction. Guides inquiry and discussion-based instruction among the entire class. Provides engaging content for the entire class (projected onto the board). Illustrates common data gaps across the entire class, helping teachers to identify when whole-group instruction would be most beneficial.